Here it is again nearly the end of another racing season. Seems like we just got started going and it is now time to think about Championships and Banquets. Congratulations to all the Champions across the state and to those who are just about there. I ‘d like to take the time again as always and say a very grateful and sincere Thank You to all our membership tracks who have supported us with hosting a fan club day event this past season. Please help me send out our thanks again to the following tracks: Auto City, Berlin, Butler, Cherry, Crystal, Flat Rock, Galesburg, I-96, Kalamazoo, Kinross, Merritt, Mt. Pleasant, M.I.S., Spartan, Springport, and Toledo Speedways. With out these great racing facilities we as fans would not enjoy the best auto racing in the state of Michigan. Thanks once again to you all and hope to continue our relationship with each and every one of you in the 2008 racing season. We would like to send out our deepest sympathies to the family of Don Kotarski who lost his life in a practice crash in his NAMRA Indy Series car at the Whittemore Speedway last month. Don was a well liked through out the series and will deeply be missed by his family and friends. We would also like to send out a very speedy recovery to club member and figure “8” driver Joe Whisman who received a broken arm and wrist during a race at Flat Rock. We hear that his is doing fine but, will be out of action for quite awhile. “Get Well Soon Joey”! As we approach nearer to our 42nd Dinner-Dance and Awards Banquet, my thoughts go back to our first banquet in January 1967. My mother had passed away just two weeks before and thank God for the banquet coming up. It kept me busy and had no time to think about my loss. That day we had a nine inch snow fall and the phone kept ringing to find out if we were cancelling the banquet, the answer was a resounding NO. That night the people started to stagger in one by one and two by two, before long the Embassy Hall on Harper was full. What really pleased me was that the people who came in from Grand Rapids. They met at a certain location and with Willy Flokstra leading, arrived in time. We had a sell out. With Barb and I leading along with my father we lead the Grand March that someone had suggested. The food was plentiful and delicious. 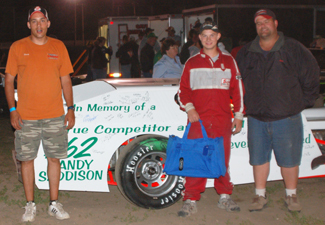 Our main honoree was the Weinberger Racing Team which included Gordon Johncock. As usual many people helped to make it a success. A good time was had by all, and out first banquet was history. our night a fantastic one. MERRITT SPEEDWAY: Another outstanding night of dirt track racing with lots of cars in the pit area made for exciting fields of racing. 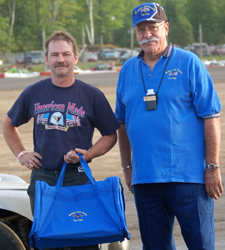 Street Stock # 15 driver Jerry Mynick was given our MARFC Uniform/Helmet bag for his continuous support of his division at the Speedway. A big thank you to “Chief” Leo Pego for the great PR for the night and our hosts Rod & Johnna Ancel for having us back again this season. MIS SPEEDWAY: Great weather and fun time had by all members who took advantage of the generosity of the Michigan International Speedway. Plenty of things to see and do before watching Cup qualifying and then Busch. Unfortunately, Mother Nature sure made a mess of the rest of the weekend. Special thank you to Dennis Worden, Sammie Lukaskiewicz and Speedway President Roger Curtis for continuing to be apart of our club and supporting us with this great free day for our members. Looking forward to the 2008 season.